An idiosyncratic sampling of the latest science papers. Forthwith: The tiny foodwebs between ants, plants, and fungi; How smoking shrinks brains; How conservation saved 20 percent of threatened vertebrate species. Plus a bonus image from space of this week’s monster extratropical storm. German reasearchers have found that a specific region of the cerebral cortex of active smokers is thinner than in lifelong nonsmokers. They used brain MRI images to measure the thickness of the orbitofrontal cortex in both groups and found signigicant thinning in smokers, the exact amount related to their daily cigarette consumption and to the duration of their smoking habit. They’ll be conducting further research on the brains of ex-smokers. 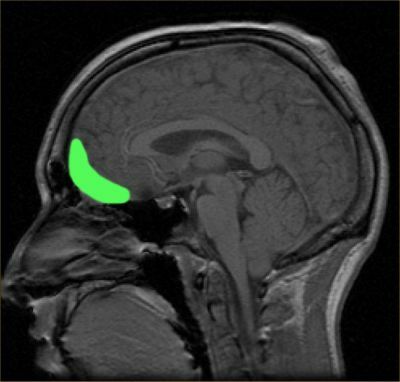 The human orbitofrontal cortex is poorly understood, but seems to be involved in decision-making and expectation associated with reward and punishment. The paper: S. Kühn, F. Schubert, J. Gallinat. Reduced thickness in medial orbitofrontal cortex in smokers. Biological Psychiatry. Approximate location of the OFC shown on a sagittal MRI. Image courtesy Wikimedia Commons. A new paper in Science finds that 20 percent of vertebrates reviewed on the IUCN Red List are now considered threatened or worse, and that an average of 52 species of mammals, birds, and amphibians move one category closer to extinction each year. Lead author Michael Hoffman says the alarming findings should not obscure the benefits of conservation action, without which, species losses would now be 20 percent higher. “Nonetheless,” write the authors, “current conservation efforts remain insufficient to offset the main drivers of biodiversity loss in these groups: agricultural expansion, logging, over-exploitation, and invasive alien species.” The paper: M. Hoffmann, et al. The Impact of Conservation on the Status of the World’s Vertebrates. Science. DOI: 10.1126/science.1194442. American Bison skull heap. 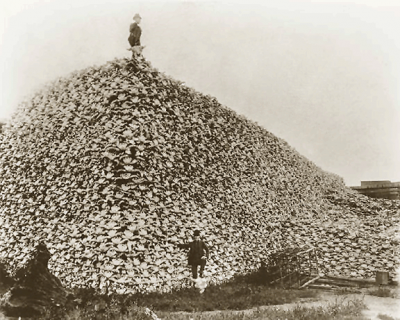 There were as few as 750 bison in 1890, the survivors of overhunting. Image courtesy Wikimedia Commons. The symbiotic nature of the fungal association has been shown in the ant-plant Leonardoxa africana and its protective mutualist ant Petalomyrmex phylax. To decipher trophic fluxes among the three partners, food enriched in 13C and 15N was given to the ants and tracked in the different parts of the symbiosis up to 660 days later. The plant received a small, but significant, amount of nitrogen from the ants. However, the ants fed more intensively the fungus. The pattern of isotope enrichment in the system indicated an ant behaviour that functions specifically to feed the fungus. After 660 days, the introduced nitrogen was still present in the system and homogeneously distributed among ant, plant and fungal compartments, indicating efficient recycling within the symbiosis. Another experiment showed that the plant surface absorbed nutrients (in the form of simple molecules) whether or not it is coated by fungus. Our study provides arguments for a mutualistic status of the fungal associate and a framework for investigating the previously unsuspected complexity of food webs in ant–plant mutualisms. 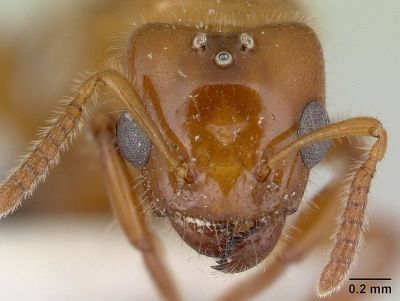 Head view of ant Petalomyrmex phylax. Credit: AntWeb.org, courtesy Wikimedia Commons. The monster storm that fouled many a travel plan this week (including mine), possessed unusually strong winds, rain, hail, and widespread tornadoes. It set a record for the lowest pressure not associated with a hurricane measured over land in the continental US. At 5:13 p.m. CDT, the weather station in Bigfork, Minnesota recorded 955.2 millibars (28.21 inches of pressure)—a low pressure corresponding to a Category 3 hurricane. Thanks to the Earth Observatory. 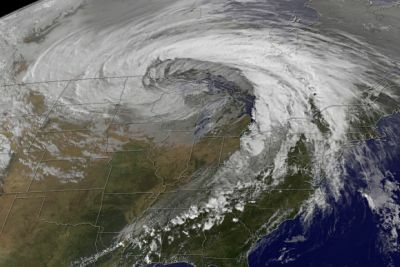 Strong extratropical cyclone over the US Midwest, 26-27 October 2010. NASA Earth Observatory imagery created by Jesse Allen, imagery provided courtesy of the NASA GOES Project Science Office.